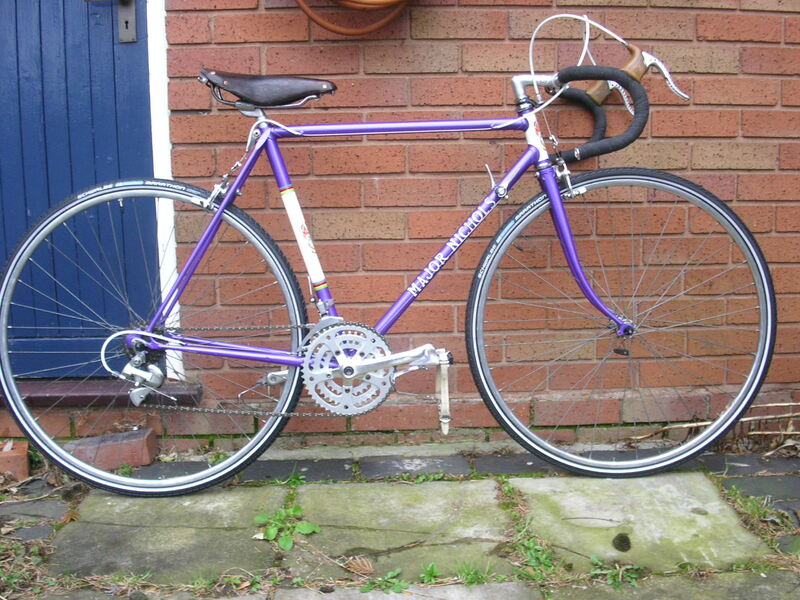 The Purple Peril frame came to me from Edinburgh. 20.5” frame. Refinished and complete with a headset and rear dropout cold set to 130mm. She had a history. The owner found her in her original orange livery abandoned at a roadside in Herefordshire early in the 1980’s while out cycling. He slung her over his shoulder and rode home to Coventry. She became a daily ride, was refinished, loaned to a friend for some years as a commuter and ultimately returned. He even made beautiful waterslide head transfers for her. It is my daily classic ‘ride of choice’ because it takes a 7 speed freewheel that allows an ageing primate to get about most places now fitness is returned. She has mostly 70’s and early 1980’s components mostly robbed from my 1958 bike to make a rideable machine but this is a photo from first build. Photo taken in 2010. Features curved brake and seatstay bridges, Prugnat lugs. Seat cluster has neatly faired in seatstay tops, not a wrap-over. Beautiful waterslide head and seat tub transfers made by previous owner.